CBS San Francisco Bay Area recently covered our Thrive Dining™ Demonstration and Tasting Luncheon. Watermark’s Thrive Dining™ is transforming the traditional meal into healthy and easy to eat finger foods. It is restoring independence and the joy of dining for individuals with cognitive and neuromuscular disorders. To read the article and view the video posted on July 4th, 2017, please click here. “We developed it to aid our residents who can no longer use utensils, can no longer remember, see well, (who) have impairments,” explained executive director Nancy Harrison. The Watermark at Rosewood Gardens has worked on implementing the idea for six months and introduced it recently to residents. 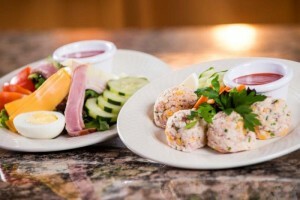 A chef salad is turned into salad balls, packed with egg and fresh vegetables. Beef Wellington with all the fixings becomes fancy finger food with dipping sauce. The panko-crusted cod is broken into gourmet morsels. “Our main goal: to make sure everybody eats, stays healthy and lives longer,” said chef Yamil Abed. If you are interested in this new program, please call 1-925-272-4553 to RSVP for one of our tasting events.